What if you could challenge your third grade students to design the train of the future? The exciting new book Transportation in the Future, Grade 3: STEM Road Map for Elementary School shows students how to do just that. Through interdisciplinary lessons that combine science, social studies, English language arts, and mathematics, Transportation in the Future encourages students to think, question, and design in a hands-on learning environment. Students will learn about U.S. geography and explore the role that trains have played in the development of the U.S. They will learn how trains work, and discuss the questions train engineers must address. They will also learn about magnetic levitation (maglev) trains and apply their new knowledge in the Maglevacation Train Challenge, where they will work collaboratively using engineering design processes to create prototype trains that could safely carry passengers. “[The book] highlights two major aspects of engineering design—problem scoping and solution generation—and six specific components of working toward a design: define the problem, learn about the problem, plan a solution, try the solution, test the solution, decide whether the solution is good enough,” the authors state. Students will learn how to read a map and distinguish features such as rivers, mountains, and oceans, as well as locate a destination and calculate distances. They will further use their mathematic skills to calculate train speeds and time intervals. The lesson plans include essential questions, content standards, key vocabulary, reading texts, links to videos and online resources, and maps. Through the in-depth and interdisciplinary modules, students will learn to use their enthusiasm, creativity, and imagination while engaging in rigorous STEM instruction that feels real. 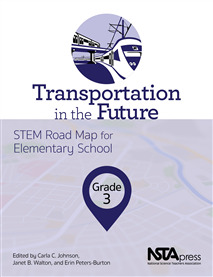 Transportation in the Future is part of the STEM Road Map Curriculum Series. The series aligns with the Next Generation Science Standards, the Common Core State Standards, and the Framework for 21st Century Learning. The series was developed by a team of STEM educators from across the U.S., who desired to infuse real-world learning contexts and authentic problem-solving pedagogy into K-12 classrooms. How interesting would your students find the idea of creating solutions that can actually help people in the real world? Would it make school more fun? If you think so, then check out Transportation in the Future, Grade 3: STEM Road Map for Elementary School edited by Carla C. Johnson, Janet B. Walton, and Erin Peters-Burton in the NSTA Store. This entry was posted in NSTA Press Books and tagged elementary, NSTA Press. Bookmark the permalink. Trackbacks are closed, but you can post a comment.